For a long time we only had an SSL certificate for www.mojoportal.com, but recently we purchased a wildcard SSL certificate so we can use the certificate for anything.mojoportal.com, in other words we now have SSL on demo.mojoportal.com, storedemo.mojoportal.com, and all the foreign language community sites like de.mojoportal.com and nl.mojoportal.com. So a wild card SSL certificate is a certificate for *.mojoportal.com which means we can use it for as many different .mojoportal.com sites as we care to create. I had some struggle with setting up the wildcard SSL certificate on my server, so I thought I should make some notes here for others who may encounter the same problems. There are several points along the way where one can easily make a mistake and create more difficulty, so hopefully these notes will help you do it the right way the first time. You can save the certificate request as a .txt file and open it in a text editor so you can copy the request and paste it when completing the steps to obtain an SSL certificate. When you receive your certificate it will be just a text file, save it on disk on your server with a .cer extension, then you click the link in IIS for "Complete Certificate Request" (shown in the 2nd screen shot above). You will then browse to the .cer file you saved and choose it. 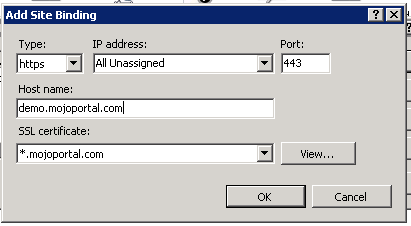 See how it is greyed out and you cannot set the host name. If you don't set a host name then you try to configure the certificate on another site, it causes an error and the second site won't start. 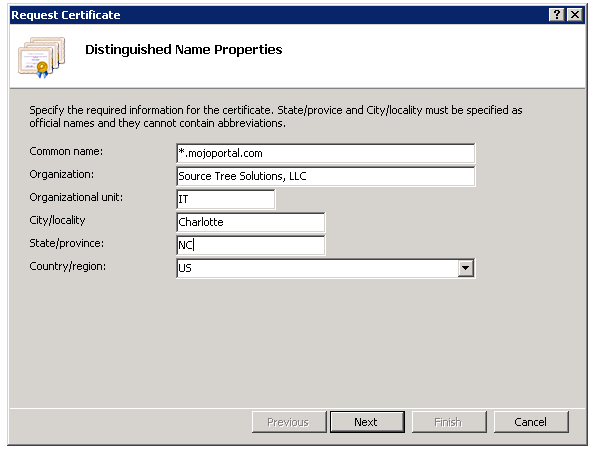 Note, if you made the same mistake as me and did not make the friendly name of the certificate start with *, you can fix it but not from IIS. Thanks to Joe Davis who told me how to rename the friendly name. 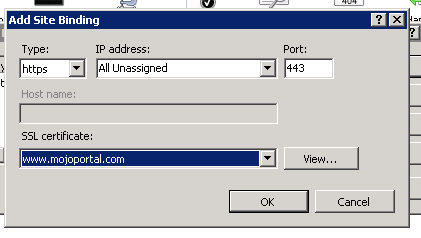 Click the Start button and then type MMC to load the Microsoft Management Console. 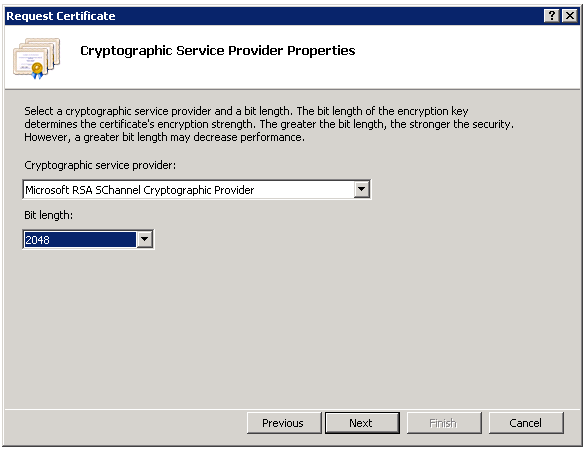 Then add the snap in for Certificate Management. From there you can right click the certificate and choose properties and you will be able to edit the friendly name. There are other ways of setting the SSL host headers from the command line if it is disabled in the UI, but it is far easier if it is enabled from the UI. Hope this article helps save you some time.